In Canada, products claiming to be organic must be certified by the Canadian Food Inspection Agency (the CFIA). For the recognizable catchall “organic” logo (a red maple leaf peaking out from an inferably organic hillside) to appear as a label, a product must contain at least 95% organic ingredients. Products containing between 70% and 95% organic ingredients can earn themselves a “contains organic” label, along with the accompanying percentile, and can still use the organic logo. Products whose organic ingredients fall below 70% cannot use the logo, but can still throw the word “organic” onto their labeling, as long as the actual organic and non-organic components in their ingredients can be found somewhere in the fine print. As you can see, within these parameters, there is plenty of room for consumer error. Furthermore, what requirements does a food item even have to meet to be “organic?” To be given this title, a food item must adhere to The Canadian Organic Standards, a list of requirements that cover everything from pesticide use to the transportation of livestock. However, the actual enforcement and testing of these standards is minimal. For instance, though the use of synthetic pesticides is prohibited, the CFIA asserts that finding such substances on products cannot be guaranteed. Can something be a GMO and still be organic? Can something be treated with certain fertilizers? Technically, yes. While consumers may infer no, and while that inference may be true in many cases, there are no explicit rules stating against such things. How does the average consumer, scanning the grocery aisle, understand which products fall under which category, who has been approved by whom and for what? Most of the time, they don’t. On a global scale, every country has its own policy for what counts as organic or not. Some countries like Canada and the US have formed trade partnerships, which choose to recognize the other’s organic certification standards as essentially equal. Products coming from out of country are inspected by CFIA-approved agencies, working on a commission basis, which is to say there is extra incentive for a products approval. And within Canada, CFIA policies only apply to food producers who intend to sell their products out of province and across the country. For producers whose sales stay within province, regulations are established provincially, and vary, though as of 2011, Manitoba, British Columbia, and Quebec have all chosen to adopt federal policies. Another paradox is the list of what ingredients get to constitute the 5% non-organic component of a product. Things like toxic food colorings and preservatives are all approved ingredients. With such a massive trade economy, there also exists a problem of accountability in labeling. After all, the prices of organic items can be more than quadruple that of their non-organic counterparts, and the temptation to profit from this may be too great for some growers and suppliers. For instance, a CFIA survey of apples showed that in 24% of the 178 apples being tested, contained some sort of pesticide residue, though, upon being uncovered by the CBC news network, CFIA was quick to claim that these numbers came from cross-contamination or mishandling. In cases where the legitimacy of an organic item is deemed suspicious, authentication testing, like Stable-Nitrogen Analysis offered by many independent scientific groups, could confirm a label’s claim. Another more exact technique called Magnetic Resonance Spectroscopy, is also being developed, and has proven to be useful in validating the purity of globally circulated products such as olive oil. However, there is no policy in place to make these types of testing mandatory before items are labeled or hit the shelves. Just recently in the US, Consumers Report National Research Center found that “questionable practices” in the fast-growing organics industry was trending. They published a survey which identified 84% of consumers buy organic food sometimes; and 45% buy at least once a month; but that there is a growing disparity between what they think the “organic label” means, and what they think it should mean. “Despite the fact that the public does not want a host of artificial ingredients in their organic food, some national advisers and decision-makers in the National Organic Program have overtly expressed a desire to grow the exemption list in order to grow the organic market. We believe this violates the public’s trust of what organic means,” says Dr. Urvashi Rangan, executive director of Consumer Reports Food Safety and Sustainability Center. It might also be argued that the organic label isn’t keeping in-step with the changing consumer landscape and the growing interest in “local” which might be emerging as being equally as important as “organic”. Some consumers might be more forgiving as to how “organic” a product is if they know that it is “organic as possible” but is coming from within a 100 miles of where they live. Consumers have clued in that organic is big business, Walmart is now the biggest buyer of organic food internationally, and that might actually make some anti-big-box consumers nervous about the organic label. Many farmers and other food producers on the local scale can be heard reflecting about their struggles to obtain ‘organic status.’ Big food producers will find that “organic” helps them improve profits but this is hardly ever the case for farmers operating within much smaller margins. Even if an item is grown organically, there is no such thing as “organic transportation”. The fuel expenditure of something that’s arriving from halfway across the world will undo the great care taken to ensure an items organic-ness. The hype of organic labeling has also, unfortunately become a fill-in lexicon for ‘healthy.’ If a product is chalked full of sugar and refined carbohydrates, as organic as they may be, at the end, they may simply not be that good for you. By continuing to support local initiatives that produce good healthy food, consumers can protect local infrastructure and supply chains and strengthen a regionalized economy. This financial security will allow for the improvement of things over time. Perhaps eventually there will be a gradual moving away from dependence on non-local sources to help fulfill the true requirements of “organic-ness.” And an organic food market that is also local means less loopholes, less ambiguous bureaucracy, and more accountability. And this will make green consumers very happy. The demand for organic food is growing, and fast. Between 2002 and 2011, its global market value almost tripled, reaching $62.8 billion. With grocery and health-food stores, food production and distribution companies all sprouting up in the name of organic, the consumer bandwagon for healthy and environmentally conscious food choices is also a sales-boosting goldmine. Along with being the world’s largest producer of tea, China is also the world’s largest user of pesticides. The excessive use of dangerous pesticides in green tea farming is having a real impact on the safety of tea in the global market. You probably wash your fruits and vegetables before eating them in hopes that it will remove any harmful residue. Odds are you don’t wash each individual tea leaf before brewing a cup. So when you steep your green tea, that toxic residue washes right off into your drink. Fumigation is a pest control process whereby a pesticide in vapour form (i.e. fumigant) is used to completely fill an enclosed space in order to control a pest. Specific conditions of temperature, pressure and time are required to ensure complete elimination of the pest. Fumigants are a very effective method of insect control as the gas is able to kill all stages of insect development as well as having the ability to penetrate into products and structures. Once insects have infested a product such as timber or flour bags, fumigation is usually the only effective control measure. Fumigation is also used as a preventative control measure to ensure pests are not transported in shipping containers. Due to its gaseous state and high toxicity, fumigants can only be applied by licensed and trained professional fumigators. 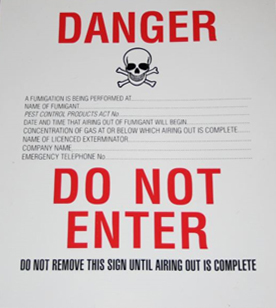 The use of fumigants is regulated by the Pest Management Regulatory Agency (PMRA) of Health Canada under the Pest Control Products Act (PCPA). The two fumigants principally used in Ontario are Methyl Bromide and Phosphine. The production and use of Methyl Bromide has been severely restricted by the Montreal Protocol for its role in ozone depletion and now can only be used under specific conditions. Due to safety concerns, Methyl Bromide requires two licensed applicators to be present during the fumigation and air out. While Phosphine is somewhat safer and easier to apply, it is not widely accepted as a suitable alternative to Methyl Bromide. According to fumigation companies the process is an effective part of infestation control in food facilities. Cereals, grains, spices, nuts, seeds, flour, pet foods, rice and pasta can all contain populations of food infesting pests such as beetles, weevils and moths.